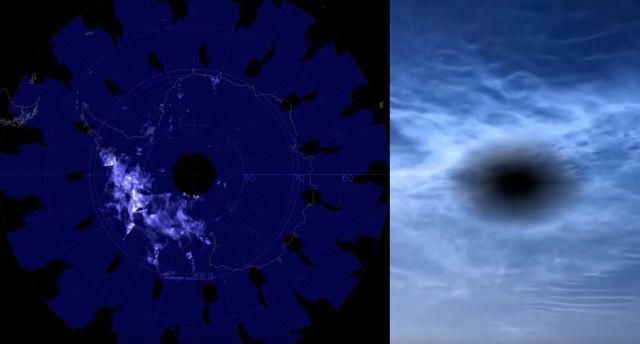 NASA's AIM spacecraft is monitoring an outbreak of electric-blue clouds high above Antarctica. These are "noctilucent clouds" (NLCs). They form when wisps of summertime water vapor wrap themselves around meteor smoke, forming swarms of ice crystals at the edge of space. If you think strange clouds in the atmosphere over remote Antarctica are of little practical interest, think again. According to Spaceweather, researchers have discovered unexpected teleconnections between noctilucent clouds and weather patterns thousands of miles away. Would you believe that winter air temperatures in Indianapolis, Indiana, are correlated with NLCs over Antarctica? It's true. Living on the Prairies with very little between me and the North Pole, I have seen several noctilucent clouds over the years. in the late evenings. Some of them rainbow colored. Much different from the Aurora Borealis which is frequently visible from here too. Fascinating stuff!